As we walk to breakfast, just before dawn, the sky is that special blue between night and day. The sound of grackles talking and gossiping in the trees fills the morning, a lone dove who-whoing among them. We leave in the early morning for another look at Death Valley. The long shadows of wind-tossed creosote bushes play on the rocky soil. Even the smallest stone casts a shadow, and farther away the folds in the hills hold what is left of the night. The bus stops by the side of the road in the low hills, giving us a chance to get out and explore the rocks and gravel for wild flowers. It is surprising how many flowers we find by looking carefully. The predominant flower color is yellow, but among the brush are others—blue, scarlet and white—in all shapes and sizes. It’s fun crunching around on the gravel, searching for color. People wander all over the hillside, bending down low for flowers only an inch high or parting shrubs that partially hide them. Then it’s on to the Mesquite Flats Sand Dunes, not far from the village of Stovepipe Wells. I admire the smooth white forms and curves of the sand as we walk out on the dunes. It’s a two-mile trek to the highest dune, but we didn’t venture that far out on the hot sand. Here and there are thriving mesquite “trees”, the sand in a smooth wind-driven flow around them. Other mesquite trees have died, their twisted skeletons, bleached by sun and wind, reaching toward the sky. It is on this smooth undisturbed sand that we see the delicate footprints of beetles that had walked there during the night. Along with them are the tracks of lizards and perhaps a kangaroo rat. The best time to view the creature tracks on the dunes is early morning, before people walk all over them. Interesting too are the tracks of humans, the impressions in the sand of many Nikes, Congress, Adidas and many other brands of shoes, all with their unique patterns. Some people, the energetic ones, venture far out on the dunes, looking very small in the vastness of all that sand. We travel a short distance back to Stovepipe Wells where we look around the village, primarily looking for shade as a refuge from the heat. Dolores and I agree that this is where we stayed many years ago. We remember going out at night to look at the stars near a bonfire. The sky was breathtaking, but our clothes smelled like smoke for a while. A trip to Death Valley would not be complete without a visit to the remains of the Harmony Borax Works. 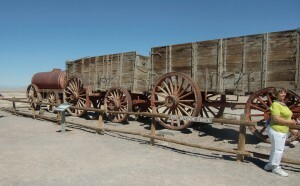 We pull up and see several of the old borax wagons, once famously hauled by a twenty mule team. Only a few walls and some old boilers remain. 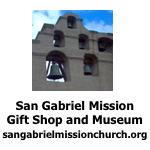 Other than gold, borax was the chief mineral mined and transported out of the valley. In fact, borax mining was responsible for opening up Death Valley. Some readers might remember the program “Death Valley Days” hosted by Ronald Reagan in 1965-65 sponsored by the Pacific Coast Borax Company, makers of 20 Mule Team Borax and Boraxo. Our last venture of the day takes us to Bad Water, the lowest point in the United States, at 282 feet below sea level. Markers up on the bluff indicate where sea level would be. We look out on the blinding whiteness of the salt flats, the temperature 97 degrees. Many people walk out on the flats, the path compressed salt, the people farthest out like tiny black lines in a sea of whiteness. Close to us are several spring-fed pools of briny water, said to support a species of snail. Pickle weed also grows in the water. Of course it was named Bad Water because the dissolved salts in it make the water undrinkable. Back in Beatty in the late afternoon with the sun in a precise angle, we watch a drift of cottonwood fluff carried on a light breeze, each cottony tuft highlighted by the sun. The mini-drama was like a slow snowfall or more like a scattering of soap bubbles, brilliant and captivating. It was a good way to end our day of sightseeing. 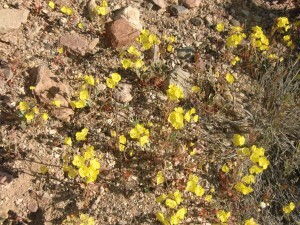 These dainty yellow flowers dominate a hillside, but many other colors can be seen if one looks closely. The Mesquite Flats Sand Dunes stretch ahead for many miles. In the morning it is a good place to find animal tracks. These old wagons, a few walls and weathered boilers are all that remain of the Harmony Borax Works. 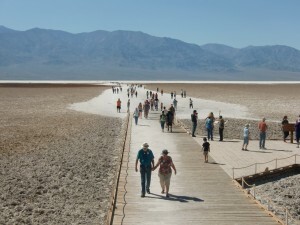 At Bad Water tourists walk out toward the salt flats on a path composed of compressed salt.